Use the tabs on the left to access information that will help you get the most out of your equipment! TractorPlus: This guide is intended to serve as a quick reference tool, providing an overview of features as well as providing tools for diagnostic trouble codes, and an instrument panel icon glossary. Find ease in attaching and detaching quick-attach implements, with instructions and photos at the swipe of your fingertips. TractorPlus users can also record observations by creating notes and saving them for future reference to maximize their knowledge of equipment setup. MowerPlus: Utilize Mower plus to do a multitude of tasks including understanding general mowing tips and how to perform proper maintenances that are custom fit to your mower. With GPS technology you can even view how large of an area you are cutting, your total difference, and your average speed. You can also explore what types of attachments that are available to your mower as well! GoBale: The application for Large Square Balers, 9 Series Round Balers, VR, VM, and VG Balers gives John Deere baler equipment operators the ability to optimize their machine through proper machine and monitor setup, as well as maintenance and in-field procedures. This guide is intended to provide a quick-reference overview of key adjustments, maintenance, and procedures right at your fingertips. GoBale App users can also record observations and save them for future reference to ensure hours spent in the field are maximized to their fullest potential. GoTill: The app gives John Deere 2730 Combination Ripper operators the ability to optimize their machine as they enter the tillage season. At John Deere, we understand that every minute in the field is valuable during the tillage season. This guide is intended to provide a quick-reference overview of key adjustments, maintenance, and operation of the 2730 Combination Ripper right at your fingertips. GoTill App users can also record observations (notes and/or pictures) and save them for future reference to ensure hours spent in the field are maximized to their fullest potential. PlanterPlus™: the newest app from John Deere, combining the information from the GoPlant app to setup your planter, and the ability to perform Row Runoff and Meter Performance tests from your mobile device, to help optimize the settings on your row unit. PlanterPlus™ supports the ExactEmerge, 1775NT, 1725, DB44, DB60, DB66, DB80, DB88 DB90, and DB120 Planters, complementing the user manual to suggest initial settings for both the machine and the display and helping you connect the planter to your tractor. GoSeed: Gives John Deere 1870, 1890, 1895 Air Drill and 1910 air cart operators the ability to optimize their machine as they enter the seeding season through proper equipment and monitor setup, as well as maintenance and in-field procedures. This guide is intended to provide a quick-reference overview of key adjustments and setup instructions to optimize your Air Seeding tools right at your fingertips. GoSeed app users can also record observations (notes and/or pictures) and save them for future reference to ensure hours spent in the field are maximized to their fullest potential. GoHarvest: Gives S, W and T series combine operators the ability to optimize their 2012 or newer machine as they enter the harvest season. Operators choose the model of combine and type of crop. GoHarvest suggests initial settings for that crop type. GoHarvest also features a notes section and photo functionality to give combine operators a premium experience when setting their machine. 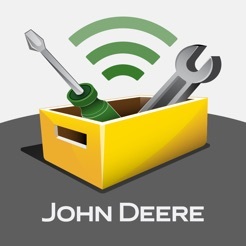 JDLink™: is John Deere's telematics system designed for customers and managers who desire to take their operation to the next level of productivity and efficiency without leaving the office! Using JDLink™ information to optimize a machine is no different than pulling a soil sample to identify what nutrients are needed to produce a high yield. Using the power of JDLink™ can optimize productivity, increase uptime, and boost profits with JDLink™ information all from a laptop, desktop, or mobile device. 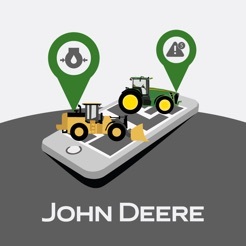 SolutionsPlus: is your toolbox for managing technology product offerings from John Deere. The SolutionsPlus app is used to support, configure, and enable the functionality of select John Deere precision technology products for agriculture, construction, and forestry industries. AgLogic™:provides a logistics solution for your tender drivers. The tender app is designed to connect with both AgLogic website and AgLogic Advanced license for Applicators to provide a complete logistics solution that is customized but not limited to the spraying and application industry. It can be leveraged to meet other logistics needs in your operation. Tender drivers are able to quickly view their entire schedule for the day or easily get driving directions to their next delivery location. Updated location information is reported back to dispatch every minute to provide a current status of your entire fleet locations.